Rarely is it witnessed that Goan potential is tapped to take it to international standards. This could only be achieved by someone who has had training of a high degree, someone who can gauge latent talent where others might be dismissing of the same. Choir master Santiago Lusardo Girelli, a native of Brazil, is one such person. Goa University has provided an opportunity to international educators and scholars to enrich their students and enquiring minds with knowledge of various subjects. These academics are welcomed by the Visiting Research Professors Programme (VRPP). In maestro Girelli’s case, it is specifically the Anthony Gonsalves Research Professorship in Western Music that brought him to Goa University. Girelli has an interesting background. An Argentinian of Italian origin, he has been a student of music and philosophy from his early years and has built a career patterned on these two spheres of knowledge. He is a choir and orchestra master, a performer in his own right and a composer with an oeuvre of twenty five CDs to his credit. He has conducted musicals such as Les Misérables and The Phantom of the Opera; and the Symphonic Orchestra Hombres Nuevos (2007-08), the National Youth Orchestra of Peru, the Imperial Orchestra from Cuzco (2008), and the Banuev´s Choir during the Youth International Meeting in Rome (2000). Apart from these accomplishments, Girelli has also worked with El Sistema (The System), which gives children from extremely poor families a chance at rising above their situation through the learning of music. 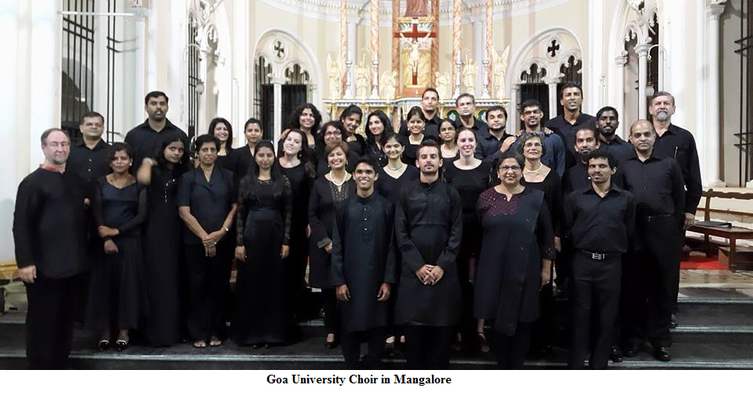 The debut of the Goa University Choir saw a repertoire of music entitled Hanacpachap, at Holy Cross Church, St Cruz, in August 2013, where the audience was regaled with an exquisite rendering of sacred music in different languages: Latin, Spanish, English, Quechua, the language of the Incas and Nahuatl the language of the Aztecs. Da Pacem Cordium (Give Peace to every heart) was performed at The Monte Music Festival and St Alex Church, Curtorim, to an astounding triumph, with the integration of sitar, table and bansuri. The concert also featured Welsh composer Karl Jenkins’ The Peacemakers with texts from Gandhi, Martin Luther King, the Dalai Lama, Nelson Mandela, Mother Teresa, Anne Frank, the Bible, the Quran and choral music by Benjamin Britten. The latest concert compilation was titled Life and Death: Thoughts on a Requiem and included Requiem by Karl Jenkins with interjections of Japanese death poems in the form of haiku. The choir performed this compilation at the Saligao church and later in Mangalore at St Joseph’s Seminary in 2014. Alver D’Souza is a student of Goa University. He sings bass and joined the choir a little after the first concert. He says, ‘Learning Latin was a bit of a struggle but not impossible.' He is certain that Girelli’s balance of discipline and humour has vastly contributed to the success of the choir. The passion of the singers can be experienced in his statement, ‘Singing Lacrimosa made me feel like crying.’ Visiting faculty, musician Mark Troop, has made a notable contribution to the consolidation of the choir’s performing ability, according to Alver. Graziella Gonsalves has been part of the choir since its inception. A mezzo-soprano who usually sings soprano, she greatly esteems the enviable training she has received and the musical knowledge she has acquired from international as well as local musicians. She states, ‘It has been a true privilege to have maestro Lusardi Girelli as our choir conductor. Besides having learned fruitful ways of using my vocals effectively, I have also experienced the beauty of singing in communion with others. We have been taught to see the big picture ie several voices as one voice – one experience and a beautiful one. It teaches one to maintain a balance. It teaches you how to coexist. It is the idea of community living.’ Her exhortation of improving our standards in India, where music is concerned, resonates with the idea that our people have potential galore. There is only the need for recognition and pursuing training of an international level. Regarding the hurdles faced by the choir, Dr Luis Dias, who has been instrumental in the formation of the choir, says, ‘Like any collective musical endeavour, it has not been easy finding a time and place that is convenient to everybody to attend. But it is heartwarming to see the build-up of interest, and usually in the last few weeks, the attendance is really quite impressive. The transport situation being what it is in Goa, this is no mean feat.’ The other issue is the paucity of university students in the choir as a result of conflicting lecture schedules and the difficulty in travel for those who live in far off regions.